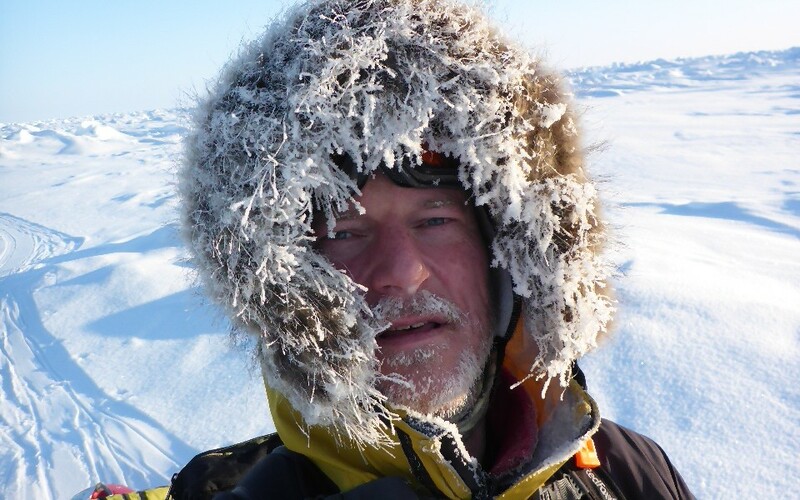 start: It is incredible that I sit now on a comfy sofa having been to the North Pole and reflect on my journey as a whole. Wow. The picture above tells a big part of the story, the cold, the challenge and the fundraising. The flag carried to the Pole to celebrate the achievement and many of the businesses that donated so much to my chosen charities. As I write the total raised is just under £46k and rising. A mindboggling sum of money that is working hard for four brilliant charities. It doesn’t stop now either, I have donations coming in, some talks to do and even a final e-auction of donated items to run! You can probably guess that I’m thinking of setting a new target…..£50k has good ring to it! My heartfelt thanks to BRE, Atlas Translations, Arch Timber Protection, CenturyOne Publishing, Sioo Wood, St Albans Lions Club, Northwood, Rayner Essex LLP, Sherrards solicitors, BASF Wolman GmbH and Grown in Britain. In addition thank you Icetrek, the Herts Advertiser and Fonteyne Signs (ace flag). More will be said in the coming days and weeks of the other support and donations I have received www.ed2northpole.org/sponsors-and-supporters. Diverse, creative and simply uplifting. 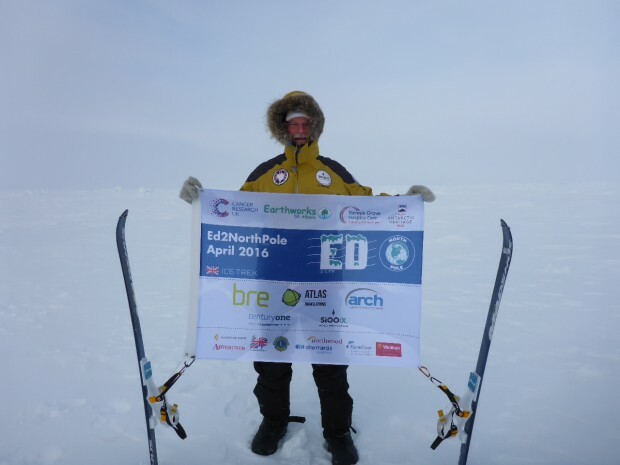 At 17:30 on 21 April 2016 we reached the geographical North Pole. 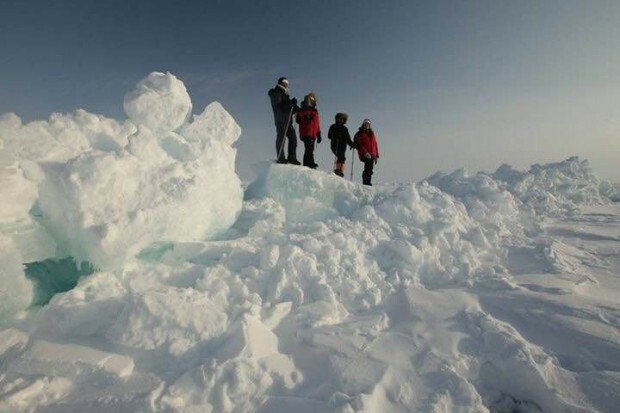 An incredible journey over the frozen Arctic Ocean to a spot where every direction is south and you can walk around the world in a few seconds. It has been an experience that will live with me forever. 21 April 2016 The frozen Arctic Ocean Elevation: 1m Latitude: 90°00’00″N Longitude: None at the North Pole! 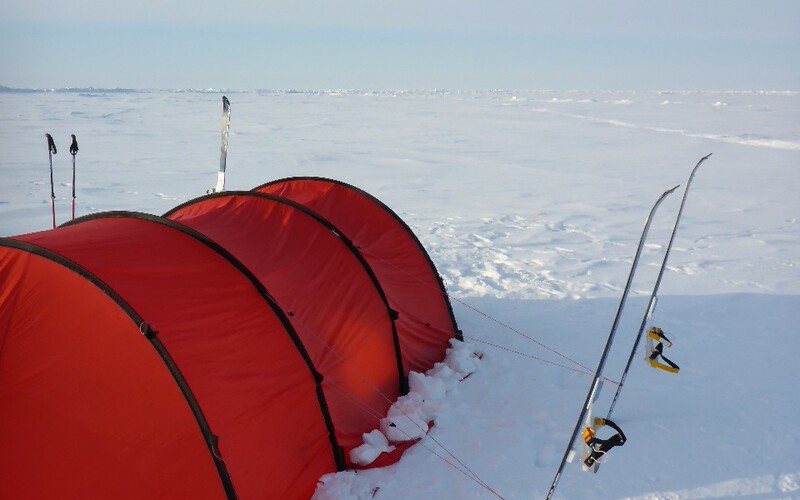 Weather: Sunny and very windy (from the south) Temperature: -29°C Distance covered today: 13km Distance to North Pole: 0km Ed is feeling: Elated! WE MADE IT! At about 1730 we arrived at 90°N the North Pole from which every direction is south and where we could walk around the world in 10 seconds! What an utterly overwhelming feeling of joy and relief at having reached our goal. 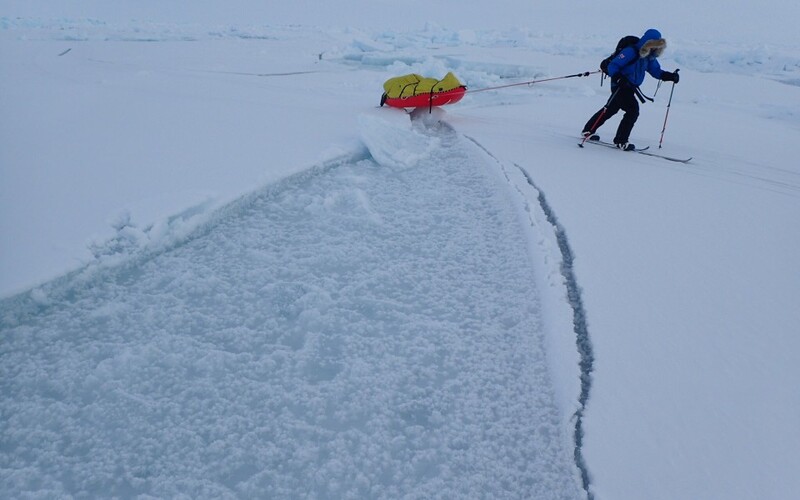 You have to be quick though, the ice we are standing on is drifting at around 100m an hour so we followed the Pole for a while before camping nearby. We had chocolates and Highland Park whisky to toast our success, this is a magical day. An utterly brilliant team to have travelled with under the instinctive guiding of Audun, well done Men in Mittens! Thank you to all of you who have supported, donated, volunteered and encouraged – those words said and deeds done got me to the Pole and I am eternally grateful. 20 April 2016 The frozen Arctic Ocean Elevation: 1m Latitude: 89°53’01″N Longitude: 130°50’14″E Weather: Cloudy and windy Temperature: -20°C Distance covered today: 14.8km Distance to North Pole: 13km Ed is feeling: Very very very excited We are so close now I think we can see the north pole from where we have stopped to camp. Still away to go and who knows what weather will bring tomorrow. A tough day today as near whiteout conditions meant visibility (contrast) was poor plus we ran into loads of long and extensive pressure ridges. Some of them were very new as the blocks hadn’t frozen together yet and there were pools of newly frozen sea with frost flowers growing on them nearby. 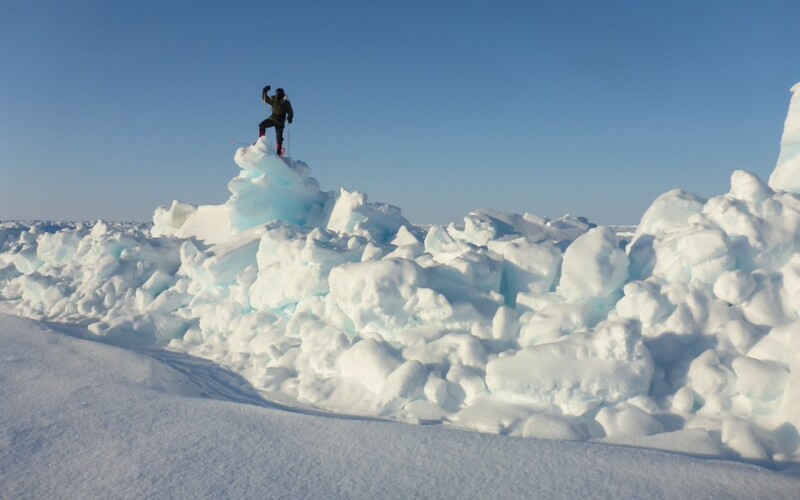 Crossed loads of cracks in the ice today which when prodded with a ski pole revealed fresh Arctic Ocean water which I was compelled to taste to make sure! 4km down to the Ocean bed, an incredible place. The team spirit with Audun, James, Keith and Rob is brilliant, we may look like a band from yesteryear reformed for a comeback album but in reality we are Men in Mittens. Tomorrow the Pole. 19 April 2016 The frozen Arctic Ocean Elevation: 1m Latitude: 89°43’57″N Longitude: 146°40’15″E Weather: Sunny and breezy Temperature: -24°C with wind chill Distance covered today: 19.8km Distance to North Pole: 30km Ed is feeling: Very excited We are getting so close to the top of the world it is amazing. It is also unrelentingly freezing and a hard slog to ski what was over 10′ (minutes) latitude today. As we are at sea effectively drifting around on the ocean it is appropriate that every degree of latitude is exactly 60 nautical miles (which is 60′ minutes = 1 degree latitude). 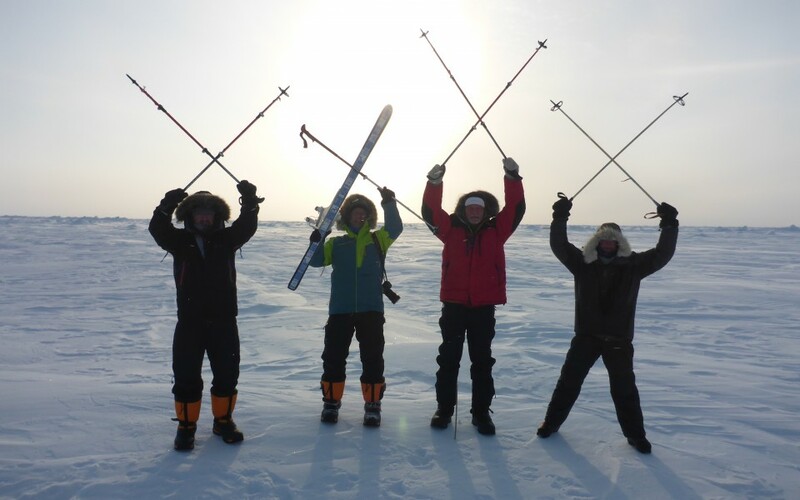 We have been wondering as we ski along what the force would have to be to move a mass of sea ice roughly 3m thick and the size of Europe at the drift rate of 100m/hour – phenomenal! We also wished we had an ice drill and could cut ourselves a fishing hole! Today we crossed lots of long small 30cm cracks in the ice where you could see down to the newly frozen ocean about a 1m below. I’ve lucked out and got chilli con carne again tonight! 18 April 2016 The frozen Arctic Ocean Elevation: 1m Latitude: 89°32’11″N Longitude: 140°55’58″E Weather: Sunny and breezy Temperature: -28°C with wind chill Distance covered today: 16.8km Distance to North Pole: 52km Ed is feeling: Excited This is such an incredible place I can’t help but be excited to be here. 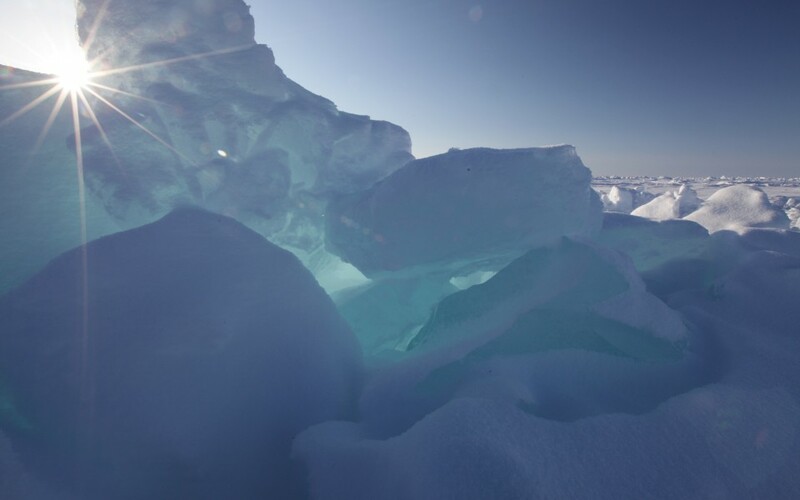 The vast white landscape is punctuated with blue and green sea ice rubble drifts that look like gemstones when the sun shines on them. Drifting snow is sculpted by the wind into beautiful peaks and sastrugi. The days are arduous 16 odd km doesn’t sound far but there is little left in my tank at the end of the day. The pulk sled is getting lighter as I eat my way through the vast rations but it is still weighty and pulls me backwards when I want to ski forwards!! We came across some other ski tracks today which was exciting as there are only three other groups on the ice that could have made them, Dixie’s team, Bengt’s team or Mascha’s group. The tent is blowing about tonight in the wind, happy we pegged the guy ropes out with our skis to stabilise our home. 17 April 2016 The frozen Arctic Ocean Elevation: 1.5m Latitude: 89°22’11″N Longitude: 140°43’06″E Weather: Sunny Temperature: -24°C Distance covered today: 16.5km Distance to North Pole: 70km Ed is feeling: Just enjoyed a delicious spag bol after another day on the ice. It has been a superbly serene day in the high Arctic with only the crunch and squeak of the snow and ice under our skis breaking the silence. 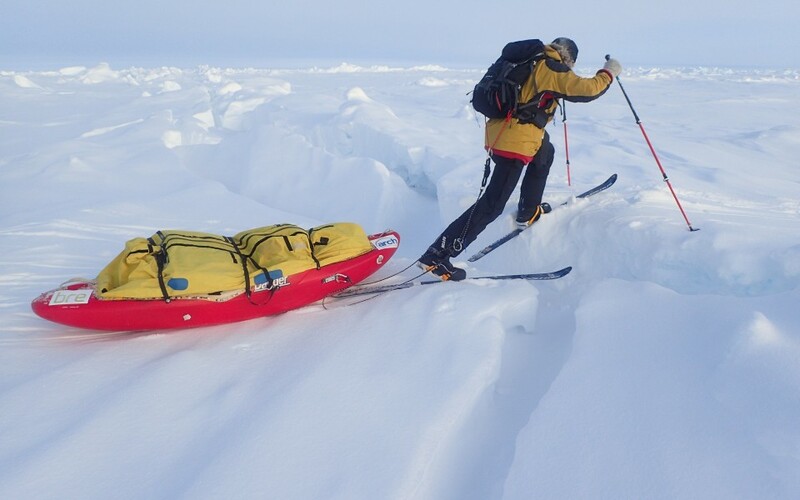 We crossed a lot of ice boulder pressure ridges which on skis produced many comedy moments as we slipped and slid our way through. We passed the halfway point of the expedition which we briefly marked. Yay! The North Pole feels within reach (we may be there on Friday). Time for another hot chocolate and then crash to sleep….good night! 16 April 2016 The frozen Arctic Ocean Elevation: 2.5m Latitude: 89°13’32″N Longitude: 137°22’40″E Weather: Sunny and light snowfall Temperature: -24°C Distance covered today: 17.5km Distance to North Pole: 86km Ed is feeling: Chuffed Chuffed as we have covered good ground today against some tricky terrain. A large refrozen lake was very helpful as its icy flatness made for good travel speeds. Passed some monster blocks of ice rubble including some sculpted by nature into what look like Rodin statues. It has been an amazingly beautiful day here, crystal sparkling surfaces of powder snow. The pulk sled is getting a bit lighter as I eat a huge amount everyday…. Breakfast: Porridge with raisins, chocolate, butter, sugar, figs Lunch: Noodles, cheese, salami, biscuits, chocolate Dinner: Chicken curry, chocolate, crisps Plus constant snacking on biscuits, dried fruit, nuts, cheese, chocolate, salami Thought a lot today about all the brilliant people who sponsored, donated to charity, supported and helped me get on the ice. Not least my wonderful family. Thank you. 15 April 2016 The frozen Arctic Ocean Elevation: 0.5m Latitude: 89°04’10″N Longitude: 133°24’17″E Weather: Sunny and fresh Temperature: -30°C Distance covered today: 12.9km Distance to North Pole: 104km Ed is feeling: Frozen A day of achievements as we crossed the 89degN of latitude and I managed to sheer my ski binding! One a moment worthy of a cheer the other less so. Thanks to Keith’s ingenuity my binding was fixed. A really beautiful but bitterly cold day passing huge ice rubble pressure ridges, tumbling blue stones like the ruins of an ancient world. I feel completely drained at the end of the day the cold and exertion are telling. When it’s as cold as it is today the breaks are really very short as you start to feel cold when you stand around. It’s also quite tricky eating cheese and chocolate at -30C ‘snap’! 14 April 2016 The frozen Arctic Ocean Elevation: 0.5m Latitude: 88°56’34″N Longitude: 131°36’07″E Weather: Snowing Temperature: -18°C Distance covered today: 13.9km Distance to North Pole: 119km Ed is feeling: Cryospheric Woke to heavy snow fall and the tent partially covered. The sun soon came out and warmed us on our way north. Beautiful effects of the sun shine off each falling snowflake. Tougher day today with soft snow, lots of ice boulder strewn pressure ridges and crossing of larger cracks in the ice – below us 5000m of the icy Arctic Ocean. Everybody fell over at some point today including our proper explorer guide Audun (he’s just won the Shackleton prize). Really tired at the end of the day. Grateful to the team spirit that pulls us forward. Now enjoying a hot chocolate with extra added chocolate. 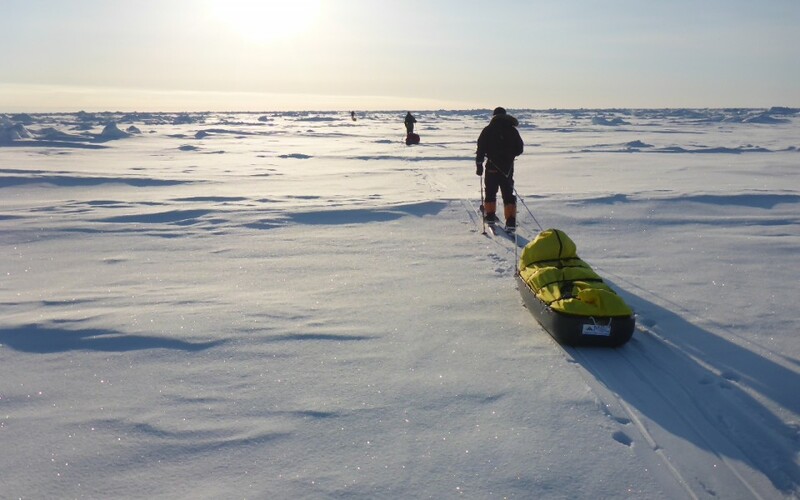 Tomorrow we will cross to within a degree of our goal the North Pole.